Students Hit the Road for Reading Days During Reading Days, some students went on short trips that complemented the service and learning they experience on campus. During Reading Days at Washington and Lee University, students are invited to pack up and head out of town for short trips that complement the service and learning they experience on campus. This year, Career Development organized a career exploration trip to New York, as well as a sojourn in Washington, D.C., to focus specifically on energy and the environment. 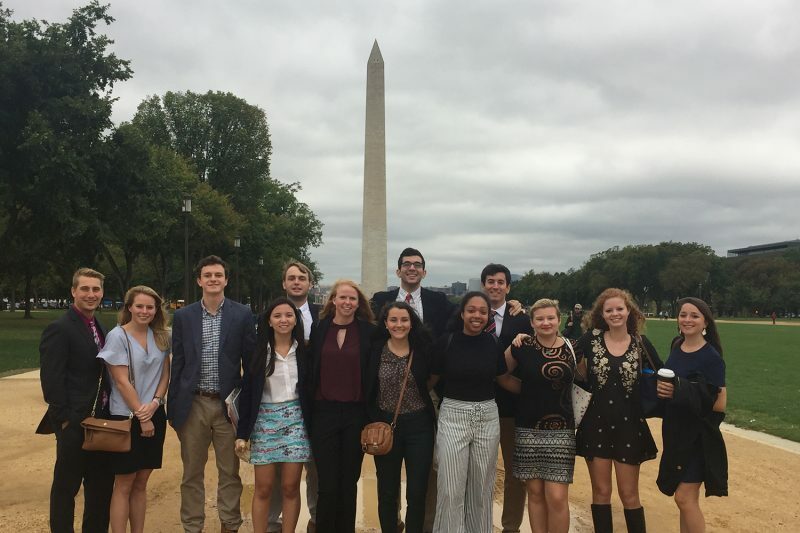 The Williams School organized an accounting trip to Northern Virginia and a visit to D.C. to focus on economics. 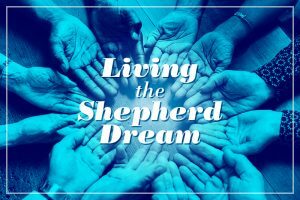 Meanwhile, the Shepherd Program’s Nabors Service League sent a group to Charleston, West Virginia, to volunteer at elementary schools. What follows are quick snapshots from each outing. Students covered a lot of ground on this trip to D.C., where they networked with alumni at NOAA, the EPA, the Department of Energy, and Conservation International. They also enjoyed a site visit and lean building discussion at HOAR construction, and learned about opportunities in energy consulting at Advanced Resources International. All told, the group got a taste of research, engineering, environment/conservation, government, finance and much more. One of the greatest takeaways from the experience was that the energy and environment fields attract extremely passionate people who use their skills to support the cause of environmentalism in a number of ways, including private industry, government and non-profit organizations. These students visited Washington, D.C., over Reading Days to learn about careers in energy and the environment. This two-day trip to the Big Apple allowed students to network with alumni, learn about internships and jobs, and visit a number of firms that specialize in a variety of industries, including publications, advertising, consulting, real estate development and fashion. Those firms included Hearst Corporation, Grey Advertising, Neely & Chloe, Symphony.com, Bain Consulting, Johnson Development Associates, LinkedIn and Major League Soccer. 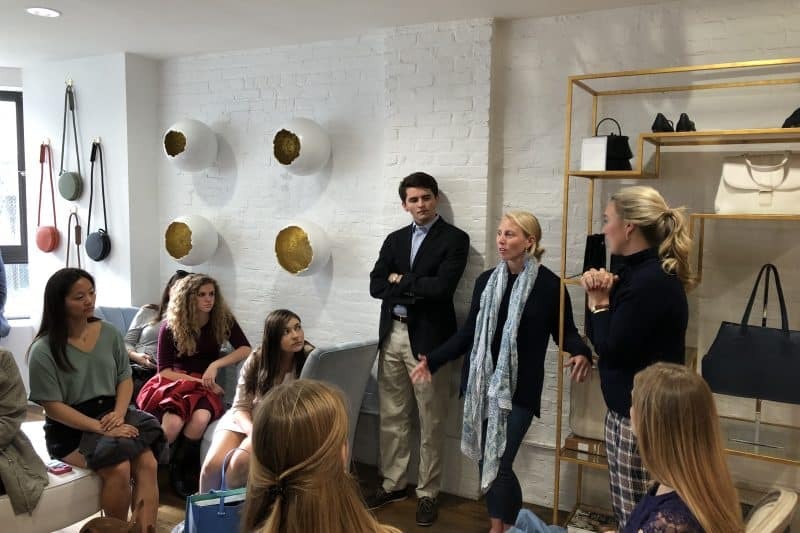 Students hear from sisters Chloe Burch ’14 and Neely Burch ’13 at the headquarters for their handbag and shoe business, Neely and Chloe. A group of six students wound their way to Wild and Wonderful West Virginia to spend three days working with local youth in elementary schools. The first day, they assisted with a garden and nutritional education program at Edgewood Elementary School. “We were also able to help with an event for Seafood Week, a nutrition program started at the school through a grand to promote the accessibility and health benefits of seafood,” wrote Fon Teawdatwan ’19, who co-led the trip with Kiki Spiezio ’18. The next day, the students worked at Alban Elementary School, where they helped second-grade students with art projects and assisted with preparation for the next day’s Wellness Walk. 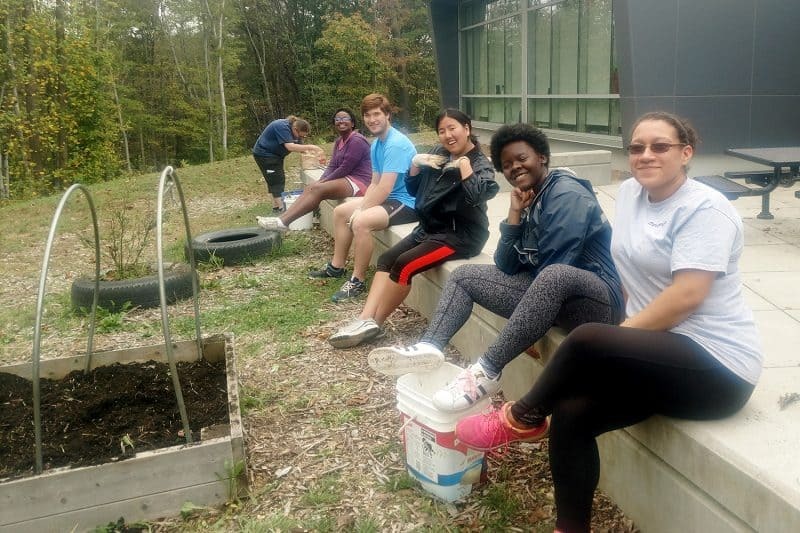 “Saturday we helped execute the event and made such a great impression that the school has asked W&L to send students again next year,” Teawdatwan said. W&L students prepare for a gardening day with kids at Edgewood Elementary School in Charleston, WV, as part of a Nabors Service League trip. A group of W&L students pose with host Aaron Krupkin at The Brookings Institute. 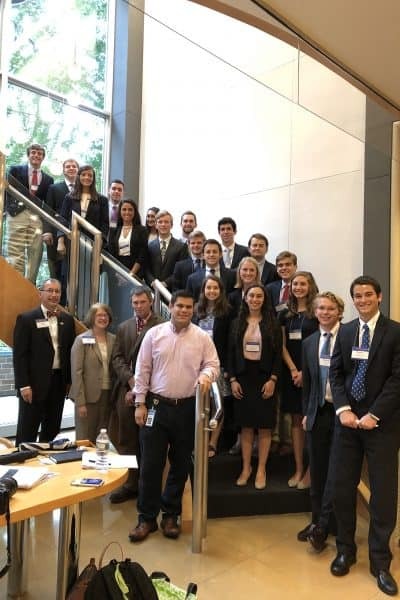 Nineteen students and five faculty members boarded a bus to D.C., where they visited several firms and heard from a number of alumni who majored in economics. Over the course of two extremely busy days, the students stopped at Economists Incorporated, Berkeley Research Group, The Brookings Institution, No Kid Hungry/ Share Our Strength, The Heritage Foundation and Uber. In addition, they heard from Federal Reserve Board Governor Jay Powell and spent some time at the Eisenhower Executive Office Building, where Andrew Olmem ’96 ’01L is special assistant to the President for Financial Policy and serves on the National Economic Council. To read more about the economics trip, click here. A pack of aspiring accountants descended on Washington, D.C., for a whirlwind, day-long deep dive into the world of professional money counting. 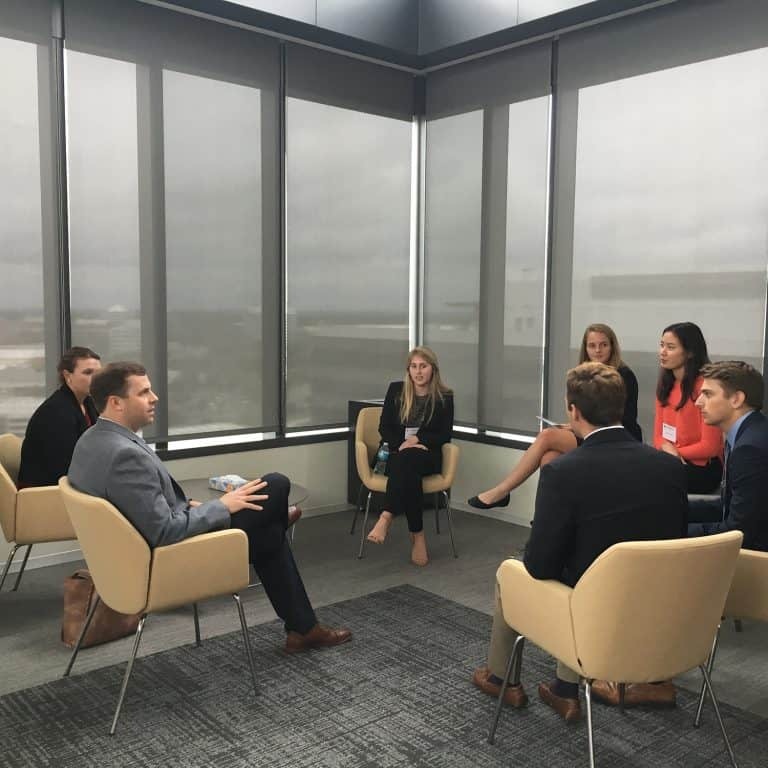 Ernst & Young hosted the students for panel and information sessions, lunch, a quick course on interviewing, and practice interviews. The panel discussion, “Day in the Life of a New Accountant,” featured panelists from the firms of Baker Tilly, Pricewaterhouse Cooper, CohnReznick and Ernst & Young. It was moderated by Pete Minutolo of Deloitte. After lunch, the group got a tour of Ernst & Young, followed by an information session on why accounting is important, consulting, auditing, tax and life as a CFO. In addition to the aforementioned firms, General Dynamics was represented in the info session. Interview strategies and practice interviews with professional accountants wrapped up the day, which was made possible by a number of W&L alumni. W&L students take part in a practice interview session at Ernst & Young with Greg Hendler ’03 (in gray jacket).